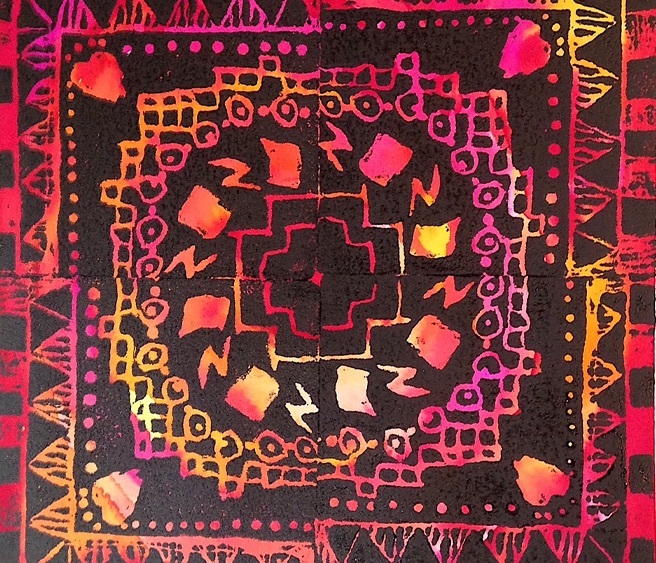 Sitka Art Circle: Explore with Prints & Color! Sitka Art Circles are a way to come together in a casual atmosphere and have a bit of artistic fun. Everyone is welcome. Let's get creative and explore with prints and color. We will create radial designs in a simple relief printmaking technique and print them on brightly painted watercolor designs. Bright colorful paintings are made with liquid watercolors, and then, using foam printmaking plates, participants will 'carve' their designs to be printed on the paintings. Lots of fun and full of surprises! Jennifer L. Anderson is a book artist and printmaker working in many of the printmaking disciplines, primarily intaglio, relief printing and stone lithography. She has exhibited throughout New England and Central California, and her work is in private collections nationwide. Anderson has a BFA in Printmaking from the University of Connecticut and completed graduate course work in printmaking and education from Central Connecticut State University and the University of Connecticut. She is currently studying to be a Great Books Scholar. Instructor will provide all materials. • Printmaking equipment: brayers, inks, etc.